Everytime I try to write fish recipe, Hilsa comes in my mind first. You know that we (Bangladeshi) Just love Hilsa. Personlly I lived on Hilsa five years (only ate hilsa fish) and never bored. Hilsa is the best fish for not only me to all Bangladeshi. 1. Heat the pan with oil on medium and add onion. Fry onion till it becomes transparent. 2. Add turmeric, bay leaf, onion paste and salt and cook it till oil comes out. 3. Add beaten yogurt and stir it well. 4. Add 2 cups water or as much water to deep the fish. 5. When it comes in boiling point, add fish and green chilli. Cook it under covered lid till fish becomes tender. 6. Check the salt and add cumin powder. Turn off the heat. 7. 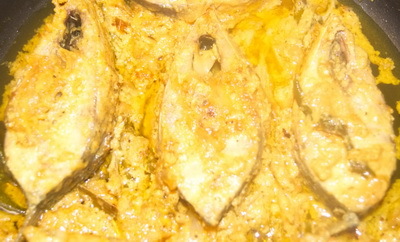 Serve doi ilish/ hilsa in yogurt hot with plain rice or polau rice. Tips: If yogurt is too sour, you can use little bit sugar. or use less yogurt and add rest of milk.